It looks like the Obama machine is trying to distract from the list of scandals piling up, and they are out to rally for gun control again. They’ve got several events in Southeast PA, specifically geared to drive photo ops for press. If you’re in Rep. Pat Meehan’s district, why not give his office a call on that day and let the staff know that pro-gun voters turn out when it matters – at the polls. The number for the office to be protested is (610) 690-7323. I’m curious if the turnout will be similar to this Illinois anti-gun rally. UPDATE: Adding two more SE Pennsylvania events. Ya think OFA had any diffculting getting a 501(c) tax exemption? Hmmmm ? ? ? ? It’s not astroturfing if they recruit local people to turn out. depends on if they are paid/hired to attend or not, right? Yes, but do you have any proof that the attendees are being paid? Sure the organizers likely are, but they are putting out a call for attendees to their email list. If this were closer to DC I would suspect it. But back to the comment, I would say that the harder the attendees have to be recruited to attend, the more astroturf-y it is, even if they are local. I’m still amused/baffled by how these people seem to really, honestly think that “the firearms industry has anything at all to do with the NRA or gun rights activism. It’s like they can’t comprehend someone disagreeing with them for any other reason than Big Corporate Money. Actually it does. That’s how they think. Its all evil corporations acting all corporationy (hat tip to Team America: World Police). They don’t even follow that logic to conclusion. 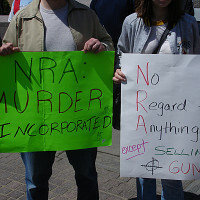 So the NRA thwarted Manchin-Toomey for corporate interests? Which was about the reselling of used guns on the private market… The bill that would have required by law for potential customers to physically go into retail gun shops where they wouldn’t otherwise have to… That’s the bill they say the NRA opposed because of corporate interests? Don’t look for logic. It’s not there. What’s there is unthinking bigotry. Winning this fight really is all about keeping the gun culture alive. I live little more than an hour’s drive from Allentown and West Chester, but if this crap was pulled in my county, they’d be driven out by pitchforks, torches, and AR-15s. Taking newbies to the range and propagating our culture is the most important thing any of us can do in this battle. Sorry if I seem to live in the past, too much, but. . . In Y2K the “Million Mom March” held a march in Allentown/Bethlehem, across the Feahy (sp?) Bridge. I had a hand in organizing the counter rally. It turned out there were about 75 “Moms” (some of them male) and about 2000 – 2500 of us. I had strongly advocated for more direct action, involving things like eggs, fruit, and vegetables, but finally all we did was turn our backs to them in silence as they marched across the bridge, with us packed on the walkway. We subsequently learned that our counter-march put a big damper on a lot of the anti-gun initiatives being considered by St. Luke’s Hospital there. It also contributed to the shutting down of a city gun buyback program, sometime later. Yep. Those creeps are planning a demonstration in my town too. It will be interesting to see how heavy the turnout is, deep inside blue-state commiefornia. Hell, I might dust off the old tricorn and counter-protest. I haven’t done that since the Million Mom March had a demonstration here about 13 years ago. I still get a laugh remembering the guy in the Darth Vader costume who had boldly marked his cape “ATF”!